Tomorrow marks the one-year anniversary of Donald Trump’s inauguration, and we’re just hours away from a government shutdown. That tells you all you need to know about how dangerous and destructive this presidency has been. Republicans control the House, the Senate, and the White House. Any government shutdown falls 100% on them. In fact, there has never been a government shutdown when one party has controlled the White House and both chambers of Congress. This Republican recklessness is hurting our military and veterans, children who need health care, and Dreamers who deserve compassion and the chance to stay in the only country they’ve ever called home. It’s hurting retirees and community health centers, people in need of opioid addiction treatment and communities in Florida, Texas, Puerto Rico, and California that are still recovering from disasters. This is Trump’s Republican Party: Chaos, incompetence, and moral failure. Democrats want a deal. We are at the table. We have put forward bipartisan agreements but Trump and Republicans refuse to work towards a deal. They are bringing us to the brink. But Democrats will continue to fight for the values of the American people. 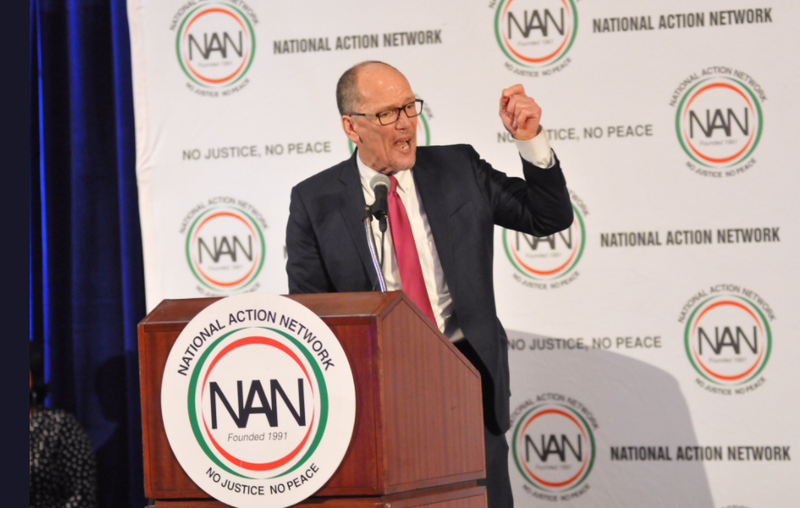 On Monday, I was honored to speak about those values, Dr. King’s legacy, and the need for moral leadership at the National Action Network’s MLK Day Breakfast. The question of moral leadership is front and center in the battle to protect Dreamers. Instead of leading on this issue, Donald Trump has decided to betray every promise he made to Dreamers and their families. Trump said he loved Dreamers and would “show great heart” on DACA. Those were lies. 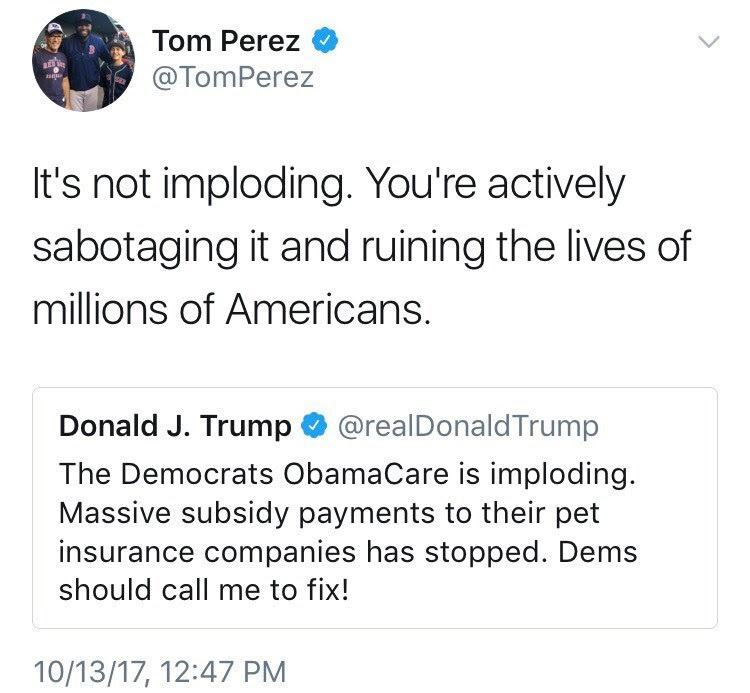 Ending DACA like he did was nothing but heartless and hateful. Dreamers are our neighbors and friends, our classmates and co-workers. The clock is ticking, and their futures hang in the balance. I wrote an op-ed in the Seattle Times about the importance of passing the DREAM Act and protecting these young people. You can read a Spanish-language version of the op-ed in Univision. I also sat down with Soledad O’Brien this week to talk about how Democrats are putting our values into action every day through our #DemsforYou program, and how we’ve been hard at work rebuilding the New DNC to win elections up and down the ballot across the country. You can watch that interview here. As we hit the one-year mark of Trump’s presidency tomorrow, it cannot be overstated how harmful this administration has been to our economy. 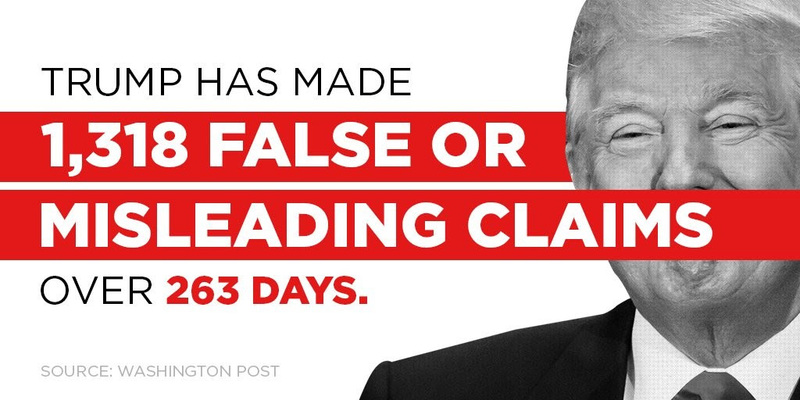 From breaking his promises to workers to passing a tax bill that rewards only the wealthiest, Trump has made it clear that he is president of the 1%, for the 1%, and by the 1%. I wrote a memorandum about the president’s first year of destructive economic policies on our Medium account this week. The best way to combat Trump and the GOP’s radical policy agenda is to elect Democrats across the country. That’s what we did in 2017, and we’re not showing any signs of slowing down. On Tuesday, we won two more elections in Wisconsin, including a state Senate seat that hasn’t been occupied by a Democrat in nearly 20 years, in a district that Trump won by 17 points in 2016. We have now flipped 34 state legislative seats in the last year. The message is clear: voters are rejecting Trump. 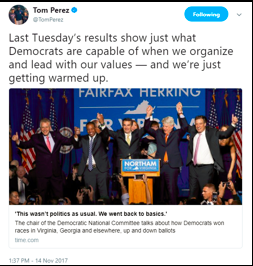 And if Democrats continue to organize and lead with our values, we can win anywhere. As we continue to win elections, we’re also focused on making sure that our presidential primary process in 2020 will be the most fair and transparent in our party’s history. The Unity Reform Commission’s work is critical to moving us forward and restoring voters’ trust in our party, and I spoke today to our Rules and Bylaws Committee about why it’s important for them to adopt these recommendations. Finally, I want to leave you with a few words about a special member of our Democratic family who we lost this week. Paul Booth was an organizing icon, a titan of the labor movement, and a lifelong champion for working families. We are deeply saddened by his passing, and the thoughts and prayers of everyone at the DNC are with Paul’s colleagues at AFSCME, his wife Heather, and the entire Booth family at this difficult time. When Paul was just nine years old, he starting handing out leaflets during the 1952 presidential campaign. Once he got a taste of activism and organizing, he never looked back. 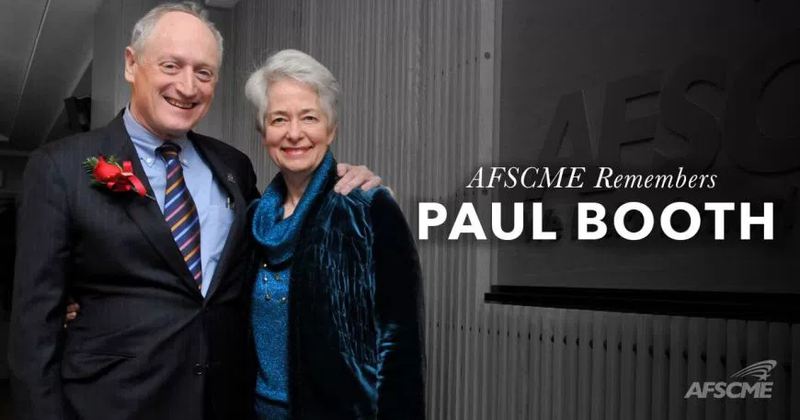 From his days standing up to apartheid in South Africa and fighting for factory workers in Chicago to his decades of leadership at AFSCME, Paul devoted the rest of his life to organizing for the civil, social, and economic rights of all people. And in 2016, we were honored to have Paul serve on the DNC committee that drafted the most ambitious and progressive platform in our party’s history. Throughout his life, Paul preached the principle of solidarity and urged everyone around him to be “missionaries” for the labor movement. Over the course of more than five decades, he and Heather have inspired generations of activists to continue organizing for social and economic justice. 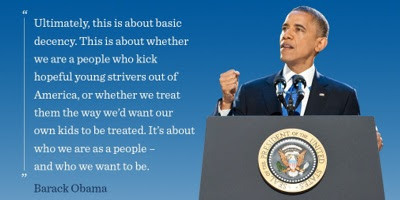 When he spoke about the battles ahead – for better wages and retirement security, for the right to organize and bargain collectively, for the justice, equality, and economic opportunity that everyone deserves – he liked to say, “We are in this together. We will fight it together. And we will win it together.” With Paul’s legacy as our guide, we will carry on the fight for a better future together. I hope you had a restful holiday season, but now that the new year has begun, Democrats are back at work. Over the last year, we’ve made incredible progress. We have now flipped 33 state legislative seats from red to blue. We’ve won in deep-red districts that Trump carried in 2016, including three state legislative seats in Oklahoma, as well as critical races in New Hampshire, Florida, and elsewhere. We’ve elected Democratic governors in Virginia and New Jersey – the first time we’ve won both in more than a decade. And just last month, we helped Doug Jones become the first Democratic senator from Alabama in 25 years. We have some wind at our back, but success is not destiny. To keep the victories rolling, we’ve got work to do. The American people are sending a message at the ballot box: The days of Donald Trump are numbered, the new age of Democratic leadership is just beginning. And Republicans have been put on notice for 2018 and beyond. We’re just 304 days away from Election Day 2018, so we’re fired up, and we’re kicking off the new year by putting our values into action. 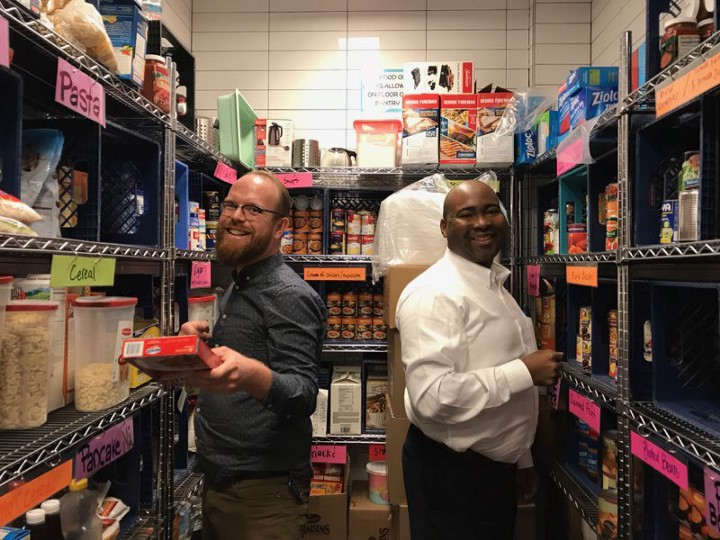 Democrats across the country have been organizing to give back to their communities like never before. Read DNC Associate Chair Jaime Harrison’s Medium Post about Dems For You here. This week, we also saw Trump dissolve his sham voting commission. This is a victory for our democracy, but we won’t let our guard down for one moment. 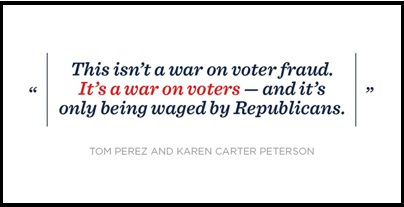 Make no mistake: Republicans aren’t waging a war on voter fraud, they’re waging a war on voters. 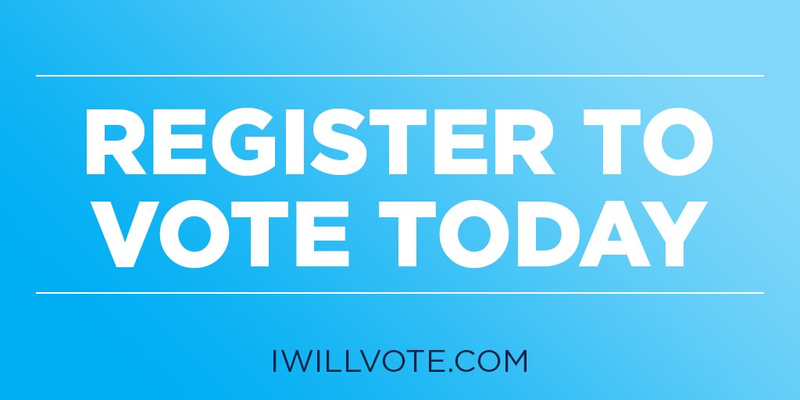 As Democrats, our goal is the engage every eligible American voter as an active participant in our democracy. We want to make it easier, not harder for people to vote. And that means fighting voter suppression tactics to create free, fair, and accessible elections. As we begin the new year, the DNC is working harder than ever to protect the one right that preserves all others—the right to vote. 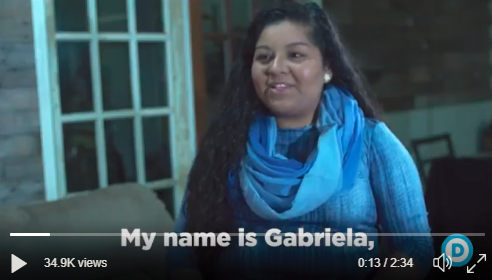 As Congress gears up to take action on America’s broken immigration system, we’ve launched a new video series called “American DREAMing” to highlight the importance of DACA and why we all must fight for DREAMers. In the time since the Trump Administration eliminated DACA, more than 13,000 DREAMers have lost their legal status to live, study and work in the United States of America. As we enter 2018, the fate of nearly 800,000 DREAMers continues to remain in the balance. Trump’s reckless decision to end DACA without a proper legislative solution will not only harm DREAMers but also our nation’s economy. It’s time for Republicans to put politics aside, pass the DREAM Act, and give DREAMers the opportunity to continue making invaluable contributions to America. 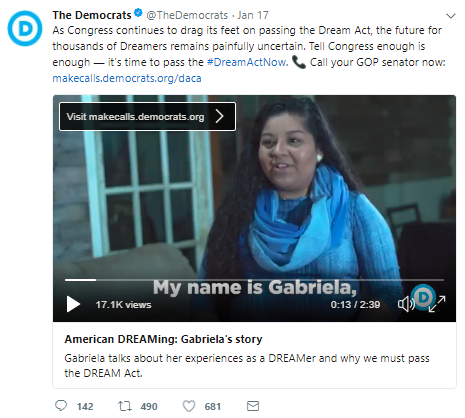 Congressional Democrats stand ready to pass the DREAM Act. It’s the smart thing to do for our economy, and it’s the right thing to do for our country. Democrats believe our diversity is our greatest strength. We will always fight for hardworking families and a smart, sensible immigration system. I’m excited for the year ahead and thrilled to work with all of you to build a better DNC, organize to win elections from the school board to the Oval Office, and fight for a brighter future for all Americans. They didn’t even read the bill! #1 Republican senators didn’t even read the bill: Instead, they passed it under the cloak of darkness this past Saturday morning, after its pieces were being redrafted and edited hours before the vote. New Jersey Sen. Cory Booker even hosted a late-night Facebook Live broadcast at his office in which he attempted to read the 500-page text, but couldn’t even get a quarter of the way through it before he was forced to return to the Senate floor. 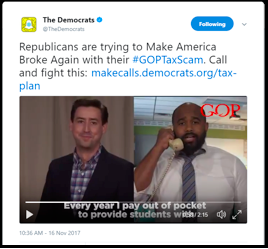 #2 The GOP tax plan raises the deficit: Hardworking Americans woke up Saturday morning to a tax plan which raises our deficit by $1.4 trillion — to the benefit of big corporations and the 1%, and all at the expense of programs like CHIP that help children access health care, the G.I. Bill that helps veterans and their families get a college education, and other important programs that people count on for subsidies to afford health care. #3 The GOP tax plan raises taxes on the middle class: Even while adding to the deficit, this tax plan raises taxes on most middle-class families. Within a decade, nearly half of Americans would see an increase in their taxes. 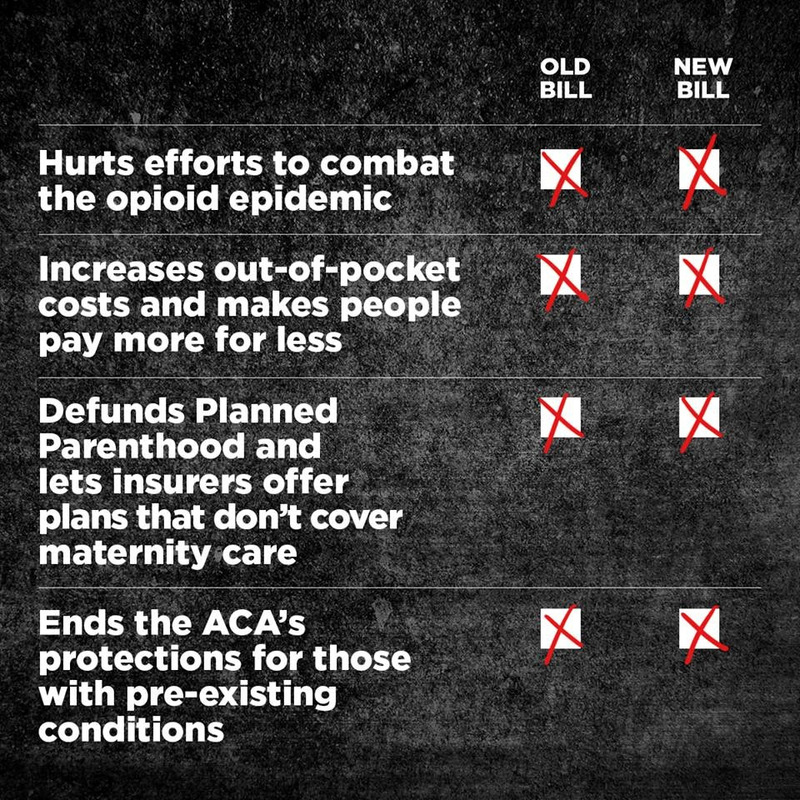 #4 Here’s what’s next: Right now, Republicans in the House and Senate are working behind closed doors to reconcile the differences between their two plans. They have the power to demand, create, and pass legitimate tax reform that works for all Americans, not just those at the top. But with Paul Ryan and Mitch McConnell running the show, and Trump impatient to sign something, we’re not holding our breath for them to do the right thing. Democratic senators and House members are doing everything they can to fight for better options. We’ll keep you updated as the situation changes, Kathleen. Thank you for helping fight back. We know you all are already aware of this weekend’s upcoming Unity Commission Meeting, but wanted to share the updated detailed press release with you. As always we will send additional updates as we receive them. THIS WEEK: DNC Unity Reform Commission to Meet in Washington, D.C.
WASHINGTON – On Friday and Saturday, December 8-9, the Democratic National Committee’s Unity Reform Commission will hold its final meeting in Washington, D.C. Over the course of the two-day event, Unity Reform Commission Chair Jen O’Malley Dillon and Vice Chair Larry Cohen will lead discussions on the final recommendations of the commission. The commission is mandated to issue its report and recommendations to the DNC Rules and Bylaws Committee no later than January 1, 2018. Press must RSVP here to guarantee a credential. The meeting is open to the public. Those interested in attending can RSVP here. Created during the 2016 Democratic National Convention, the commission will recommend improvements to ensure the presidential nomination process is accessible, transparent, and inclusive. The commission is made up of 21 members selected by Sec. Hillary Clinton, Sen. Bernie Sanders, and DNC Chair Tom Perez. It’s been a whirlwind week here as Republicans in Congress have tried to ram through their disastrous tax bill. This is nothing more than a scam that was written for Donald Trump and his wealthy friends, not for hardworking American families. This bill would hurt workers and small businesses, students and teachers, homeowners and older Americans; it would take away health insurance from millions, make it harder for people to save for retirement, and devastate our economy while adding more than a trillion dollars to the deficit over the next 10 years. In fact, while Republicans try to give big corporations and the top 1% another massive windfall, their plan would raise taxes on at least half of Americans. Voters won’t forget this betrayal on Election Day. And as Republicans continue to turn their backs on the people they’re supposed to represent, Democrats will keep fighting to build an economy that works for everyone. As Republicans in Congress try to raise taxes on the middle class, President Trump continues to make disparaging remarks toward the Native American community. At an event Monday that was supposed to honor Navajo code talkers in the Oval Office, Trump decided to use a racial slur, calling U.S. 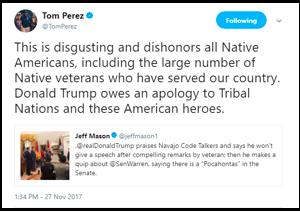 Senator Elizabeth Warren “Pocahontas.” These code talkers deserve our nation’s praise and gratitude, not a president who disrespects the Native American community and dishonors Native American veterans. What Trump displayed this week was an embarrassment to our values and a disgraceful insult to the heroes of our history. 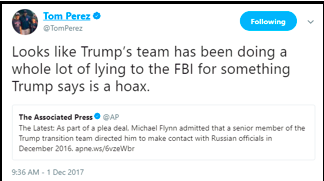 We also saw more important developments in the Russia investigation with Michael Flynn’s guilty plea and decision to cooperate with investigators. This time, the president can’t get away with claiming these charges aren’t about his inner circle’s contacts with Russia, and he can’t dismiss his former national security advisor as some low-level aide. 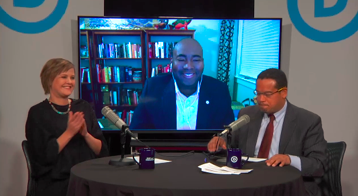 On this week’s episode of Democrats Live, Keith Ellison hosted DNC Associate Chair Jaime Harrison and Lori Lodes, the co-founder of Get America Covered. They discussed open enrollment, why it’s important, and how we can continue to shield our health care law from sabotage. Check out the latest episode at live.democrats.org. 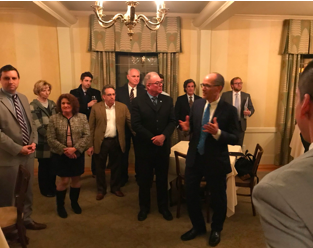 Finally, I headed out to Rhode Island to rally Democrats at the state party’s fundraiser this week. 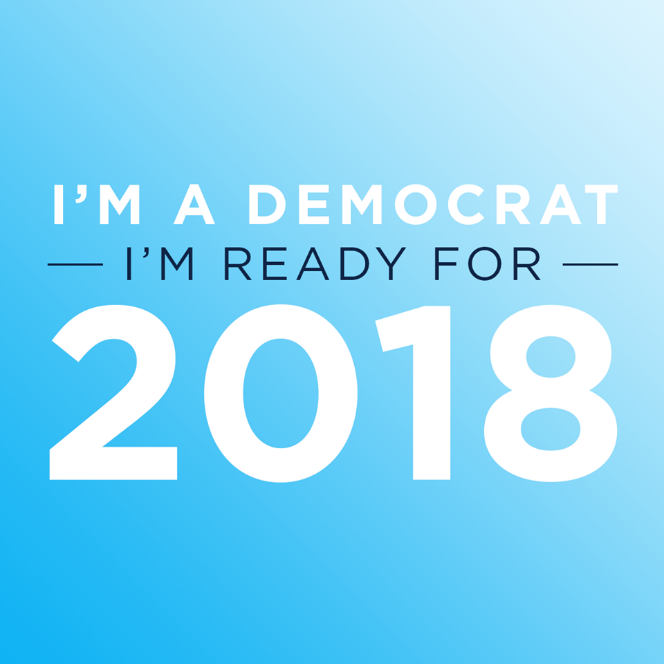 2018 has the potential to be a huge year for Democrats. People are talking about a blue wave. But we can’t just cruise and wait for a wave to carry us to victory. We have make it happen. We have to build that wave ourselves. We’ve got to organize. We’ve been focused a lot on turning red states blue. That’s critically important, and we’re already making remarkable progress. But we also need to hold our ground and keep making progress in states like Rhode Island, where we control both chambers and the governor’s office. It would be a big mistake to take the governor’s office for granted. That’s exactly the kind of mindset that opens the statehouse doors to Republicans. Just look around the map. Every state north of Rhode Island has a Republican governor. And before Governor Raimondo, you have to go back to 1992 to find the last Democrat elected governor of Rhode Island. So we’ve got work to do. Politics isn’t a spectator sport. The wind is at our back, but the only way we’ll win is if we field a full team that’s ready to work together. As we head into the holiday season, I want you to know how grateful I am for your tireless work on behalf of our party and our country. Thank you, again, for all you do. 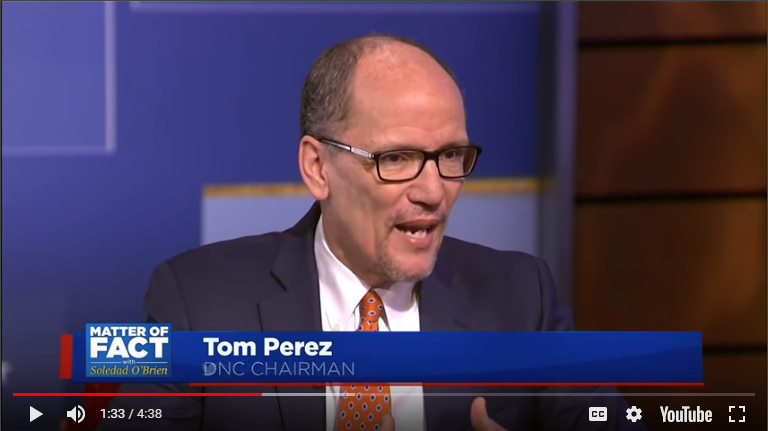 Throughout this past year, the Democratic National Committee has been focused on rebuilding and electing Democrats up and down the ticket. Through the “Every ZIP Code Counts” program, the new DNC is investing in state parties and races all across the country. The result? Democrats have flipped 33 seats from red to blue, including in deep red districts that Trump swept in 2016. It has been another great week to be a Democrat. Congratulations to Tim Keller and Cynthia Borrego on their election as the next mayor and city councilor of Albuquerque, New Mexico, flipping both seats from red to blue. Voters are sick and tired of Donald Trump’s Republican Party, and they’re sending Democrats like Tim and Cynthia to City Hall to fight for working families. The DNC invested in the Democratic Party of New Mexico to support the important work being done by the state party and to organize and mobilize Democratic voters behind our shared values. I also want to congratulate Allison Ikley-Freeman on her Oklahoma State Senate victory, which flipped yet another seat from red to blue in a district that Trump carried last year. 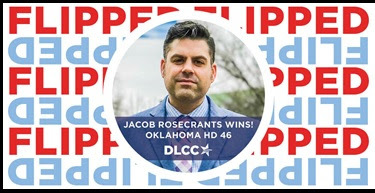 At 26, Ikley-Freeman is the third openly gay person to be elected to the Oklahoma legislature. As we saw earlier this year, Oklahomans are voting for Democrats in these deep-red districts because they know our candidates will work to resolve the budget crisis facing Oklahomans and help build an economy that works for every working family, not just a wealthy few. The DNC is proud to have invested in this race and we will continue working with the Oklahoma Democratic Party to elect Democrats up and down the ballot. On Thursday, House Republicans passed their version of the GOP tax scam. Republicans are slashing education funding, making it more expensive to buy a home, blowing a $2 trillion hole in the deficit, and gutting Medicare funding for seniors – all so they can fund another giant tax giveaway to wealthy corporations and the top 1%. 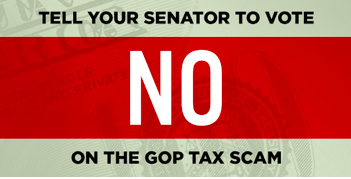 Even the author of the bill said that people most excited about it are ‘big CEOs.’ What’s more, Senate Republicans have shamelessly turned this tax bill into another health care repeal attempt. This bill was clearly written for Donald Trump and his wealthy friends on Wall Street, not for hardworking American families. You can read a piece I wrote for NBC about how this plan is disastrous here, about how this bill affects Latino families here. Democrats believe that we should reform our tax system to work better for the middle class. And we will fight tooth-and-nail to make sure this bill never makes it to Donald Trump’s desk. 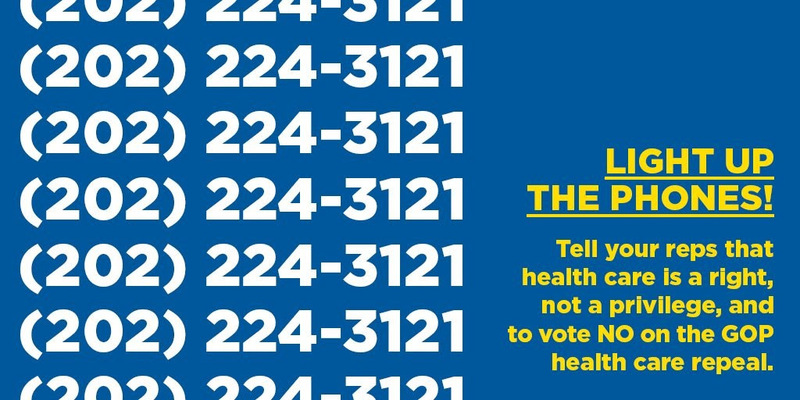 We’re urging Americans everywhere to call their Republican senators right now at (202) 224-3121 and tell them to oppose this bill. 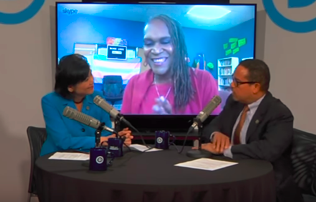 On this week’s episode of Democrats Live, Keith Ellison hosted Rep. Judy Chu for a discussion on the GOP’s plan to slash taxes for the richest 1% and corporations, at the expense of hardworking Americans. They were also joined by new Minneapolis City Councilwoman-elect Andrea Jenkins, the first openly transgender person elected to a major city’s city council. They talked about what inspired her to run, what last week’s wins meant for Democrats across the country, and how the GOP tax bill would affect her constituents in Minnesota. Check out the latest episode at live.democrats.org. From Albuquerque to Oklahoma, Democrats are flipping state and municipal seats and building a blue wave up and down the ballot across the country. You can read my recent piece in TIME about how Democrats secured major victories earlier this month and put Republicans on notice. This is the new DNC and this is just the beginning. Democrats are going to keep organizing and leading with our values, and that’s why we’re going to flip even more seats up and down the ballot in 2018 and beyond. My thoughts are with all those affected by the devastating wildfires sweeping across California. Please take care of one another and be safe. Donald Trump continued to gamble with American lives and sabotage our health care system this week. First, he issued an executive order on Thursday that will undermine protections for people with pre-existing conditions and raise premiums for those who need affordable health care the most. To make matters worse, Trump is also refusing to pay cost-sharing reduction subsidies. This heartless decision will cause millions of Americans to face skyrocketing premiums, and a million people will lose their insurance entirely in the next year. Despite his dishonest tweets about the state of the Affordable Care Act, Trump and Republicans in Congress will not be able to escape responsibility for the devastation they inflict on hardworking families. Democrats believe healthcare is a right, not a privilege – and so do the American people. But with this decision, Trump is betraying their trust and intentionally sending our health care system into chaos. It’s time for Republicans to put an end to Trump’s recklessness and start working with Democrats to protect and expand health care for all Americans. Trump also resumed his attacks on the people of Puerto Rico this week. As American citizens are dying, the president took to Twitter to denigrate and threaten them. Puerto Rico needs our unconditional support, not Trump’s childish insults and arrogant posturing. FEMA and other agencies must remain on the ground as long as needed, as they would in any other community recovering from a natural disaster. When the president wasn’t attacking victims of a natural disaster or trying to take away health care from working families, he was going after our environment. On Tuesday, Trump and EPA Administrator Scott Pruitt put the profits of the oil and gas industry above the safety of the American people by repealing the Clean Power Plan. In the aftermath of multiple catastrophic natural disasters, one would hope that Trump would rethink his dangerous denial of climate change. But as he and Republicans in Congress continue to ignore reality, Democrats will keep fighting to protect our planet and invest in clean and renewable energy that creates jobs and grows our economy. Trump capped off the week by announcing this morning that he will not recertify the Iran agreement. This is a disastrous decision, and Congress can’t allow Donald Trump’s recklessness to endanger our national security, undermine American credibility, and erode the world’s trust in our leadership. At the DNC, we’ve been fighting these attacks tooth and nail. And there’s no better tool to stop Trump’s disastrous agenda than the ballot. 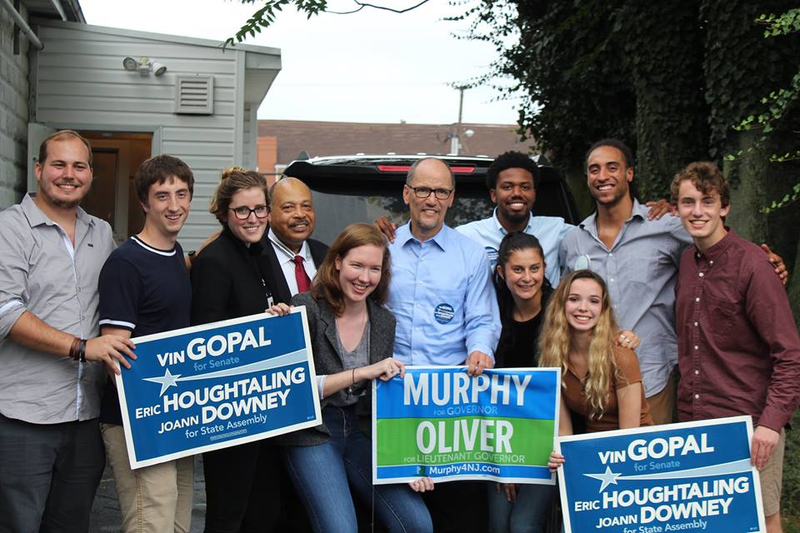 Election Day is less than a month away, and we have huge opportunities up and down the ticket in New Jersey. If we pick up 3 seats in the state senate, we’ll have a veto-proof majority. That’s why I spent Monday campaigning for Phil Murphy, Sheila Oliver, Vin Gopal, and Democrats running up and down the Garden State ticket. 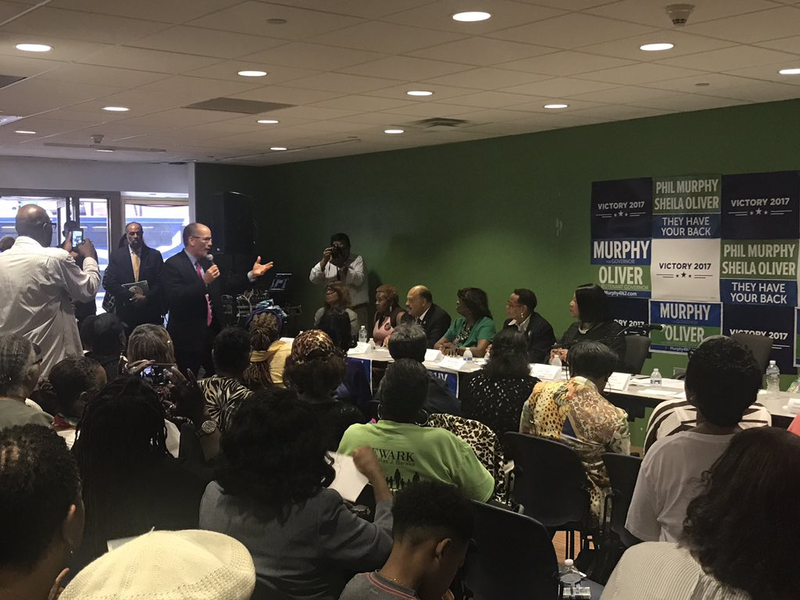 After joining our candidate for lieutenant governor, Sheila Oliver, at a lunch with African American Women for Murphy in Newark, I traveled to Long Branch for a canvass kick-off with state senate candidate Vin Gopal. The energy there is palpable; New Jersey voters are hungry for Democratic leadership. After nearly eight years of failed Republican leadership, it’s time to send Chris Christie back to the beach. We’ve made critical investments in Virginia and New Jersey, and with Election Day rapidly approaching, we need to keep building on the grassroots energy we’re seeing in these races. Our remarkable staff at the DNC has been holding phone banks and weekend canvasses, and we’re doing everything we can to get more Democrats registered. We’ve also continued our rebuilding efforts at the DNC, most recently by welcoming Daniel Halpern, Ambassador Suzi LeVine and Eric LeVine, Amy Rao, and Diane Robertson to our team as Deputy National Finance Chairs. They have a proven track record and decades of combined experience raising the resources needed to elect Democrats up and down the ballot. They played a key role in sending President Obama to the Oval Office, and they’ll help ensure that we continue to elect Democrats in 2017, 2018, and beyond. As we build on unprecedented grassroots enthusiasm and outpace previous off-year fundraising hauls, I’m excited to have this team leading the charge. Finally, we celebrated National Coming Out Day and the International Day of the Girl this week. We’re fighting every day to make the world a place where everyone is treated equally and everyone can live and love with dignity – no matter their gender identity or sexual orientation. As always, I want to thank all of you for the incredible work you’re doing to strengthen our party and our country. We’re already making tremendous progress, and we couldn’t do it without your help. The values of the Democratic Party are the values of the American people, and millions of families are counting on us to protect those values and build a better future for everyone. We are looking forward to our upcoming meeting in Las Vegas. We have listened to your input and are excited to come together to make our meetings more engaging and empowering in laying our path forward as we continue to build toward victory with the new DNC. We can’t do this without you. Our fellow Americans in Puerto Rico, the U.S. Virgin Islands, Florida, and Texas are still reeling from the natural disasters of the past few weeks. Click the link above to find out how you can help those affected. On Monday, America woke to news of the worst mass shooting in modern U.S. history. Our hearts are with the people of Las Vegas and all those affected by this despicable act of terror. Throughout the week, we’ve heard story after story of the heroism displayed by ordinary Americans and selfless first responders who risked their lives to save others. We’ve been reminded that the courage of the American people will always outlast the cruelty of cowards. As Americans, we cannot give in to fear or hatred. We must be united against all those who perpetrate such terror, and do everything we can to ensure that vicious attacks like this become a thing of the past. You can find more information about what you can do to help here. 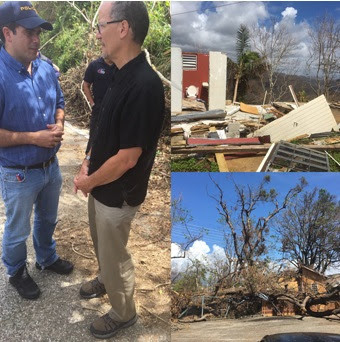 This week, I visited Puerto Rico with a delegation of Florida Democrats to bring supplies to those in need and survey the destruction. The island I know is gone, washed away by one of the most vicious hurricanes in American history. But one of the few things that wasn’t washed away is Puerto Rico’s American identity. The 3.5 million people in Puerto Rico are American citizens. They deserve fair and equal treatment as Americans. Unfortunately, we have a president who has shown a disturbing disregard for their well-being. Please read my piece in U.S. News on what I saw in Puerto Rico and how the Trump administration isn’t doing nearly enough to help the people recover. Thursday marked the arbitrary deadline set by the Trump administration for certain DREAMers to renew their status. Donald Trump said he would “show great heart” on DACA. That was a lie. Ending DACA is nothing but heartless, and every day the GOP refuses to find a solution, they put DREAMers in danger. Democrats will continue fighting to give DREAMers the opportunity they deserve to keep making contributions to the only country they know as home. We must pass the DREAM Act. Republicans were also hard at work this week undermining the fundamental rights of women and LGBTQ Americans across the country. First, House Republicans passed a bill that would impose a nationwide ban on abortion at 20 weeks. Days later, Attorney General Jeff Sessions stripped protections against discrimination in the workplace for transgender persons under Title VII of the Civil Rights Act. 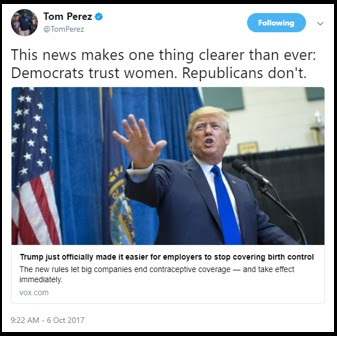 And today, the Trump administration rolled back the Affordable Care Act’s mandate for employers to offer health insurance covering contraception at no additional cost. And to cap things off, Sessions released a memo on ‘religious freedom’ that has been labeled a ‘license to discriminate’ against LGBTQ people, women, and others. Democrats will not stand for these attacks. We will continue to fight for women’s constitutional rights and combat discrimination against LGBTQ Americans across the country. 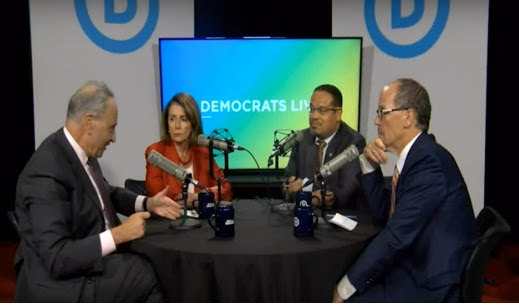 On this week’s episode of Democrats Live, Keith Ellison and I hosted Senate Minority Leader Chuck Schumer and House Minority Leader Nancy Pelosi to talk about how Democrats are fighting back against Trump and Republicans’ new tax plan and offering a better deal for the American people. Check out the latest episode at live.democrats.org. As always, we’re laser-focused on organizing and winning across the country. 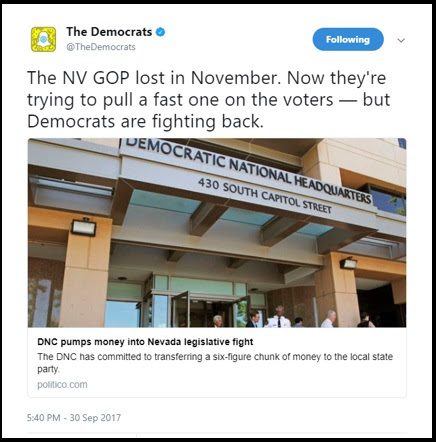 After taking over the Nevada legislature last year, we’re fighting back against the GOP’s outrageous attempts to subvert democracy through multiple recalls. You can read about our investments in Nevada here. The DNC is also actively phone banking and canvassing to make sure Ralph Northam will be the next governor of Virginia. And early next week, I’ll be heading to New Jersey to rally support for Phil Murphy, Sheila Oliver, Vin Gopal, and Democrats across the Garden State. With just over a month until Election Day, we don’t have any time to waste. But as long as we organize and lead with our values, I know we’ll be unstoppable. The past few days have been devastating for our friends in Puerto Rico and all those in the path of the hurricane Maria. Please consider donating to the Red Cross to help those affected if you can. Democrats have been united against the latest GOP health care repeal effort. And Senator John McCain’s dramatic announcement today that he will not vote for Graham-Cassidy has carried the bill one step closer to defeat. But the fight isn’t over yet. We need to make sure Trumpcare ends up in the dustbin of history where it belongs once and for all. While Senate Democrats held countless hearings, accepted more than 180 Republican amendments, and debated the Affordable Care Act for over 160 hours on the floor, Republicans will vote on a bill with little if any debate and without a CBO score or basic knowledge of how many millions of Americans will be hurt. If doctors made health care decisions for patients without knowing the consequences, they would be sued. But that’s exactly what Republicans are doing right now. This is not regular order – it’s malpractice. And any member of Congress who supports this sham deserves to be voted out of office. 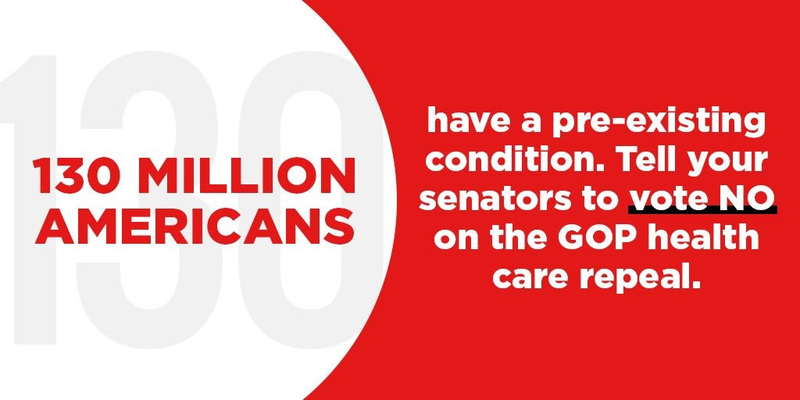 Millions of Americans would be at risk, so we need as many voices as possible to defeat this life-threatening bill. One of the most troubling aspects of this bill is its lack of funding for opioid addiction treatment. Opioid addiction is taking lives and tearing apart families. 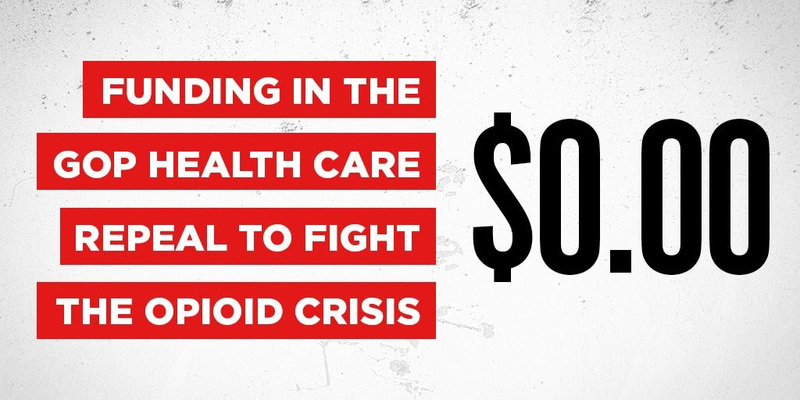 Instead of fighting to address the problem, Republicans in Congress want to ram through this partisan bill to take away people’s health care and slash billions in funding for addiction treatment. More than six weeks after calling the opioid epidemic a national emergency, President Trump has done nothing to help those affected. Now he’s leading the Republican charge to strip protections and resources from the working families who need them most. This issue knows no party. From New Hampshire to Nevada, the opioid crisis has ravaged communities across the country. We cannot sit idly by while Republicans choose cruelty over compassion and destroy the lives of millions. We must elect more Democrats to fight this urgent crisis with the urgent action it demands. We’ll have the chance soon with Election Day 2017 is less than 50 days away. Things are heating up in Virginia, where our candidate for governor, Ralph Northam, had a tremendous debate performance against his opponent on Tuesday night. Northam has spent his life as a public servant, while Republican nominee Ed Gillespie has made a career serving big corporations, special interests, and himself. Hard-working Virginians need a candidate that will support them and their families. Ralph Northam is that candidate. But the Virginia governor’s race is just one election where voters are flocking to Democrats. Our CEO Jess O’Connell and DLCC Executive Director Jessica Post published a piece on TIME.com about the recent string of Democratic victories in special elections across the country, including in some deep-red districts where Trump won handily in November. From New Hampshire to Oklahoma, the American people are sending a loud and clear message: Democratic values are American values. So much is at stake in these elections. Working families deserve a better deal from their representatives. They deserve a better deal on health care and housing, on wages and workers’ rights, on education and retirement security. 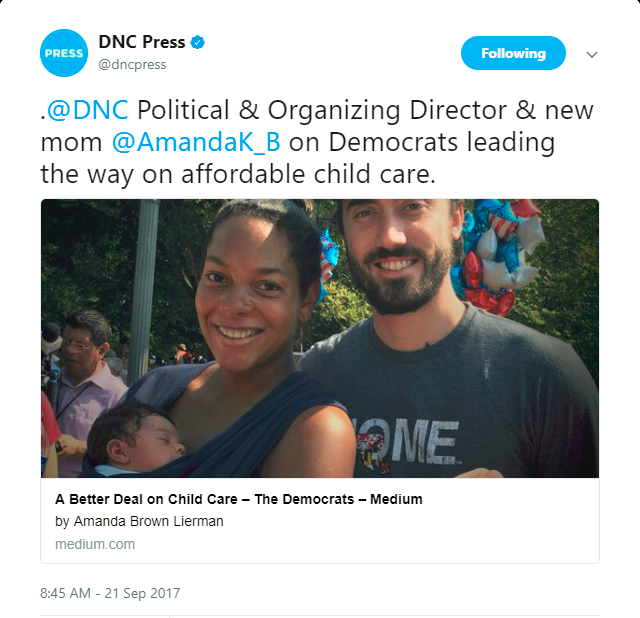 And as our incredible National Political and Organizing Director and new mother, Amanda Brown Lierman, wrote in a Medium post this week, working families deserve a better deal on child care. Democrats are offering that better deal, and the American people are responding at the ballot box. 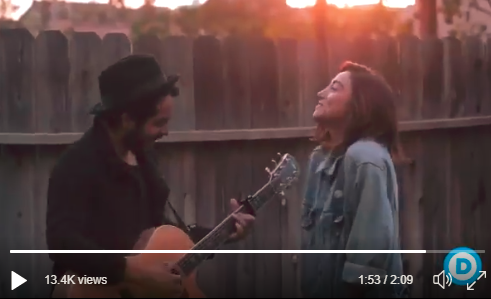 This week also marked the start of the Jewish New Year as communities in America, Israel, and around the world began to observe the Jewish High Holy Days. From the beginning of Rosh Hashanah to the final sealing on Yom Kippur, the Days of Awe are a time for reflection, repentance, and renewal. Over the past year, we’ve seen how fear and hatred can divide our country. But while each new year brings new challenges, the DNC will always be a steadfast partner to Jewish communities as we combat anti-Semitism and all forms of bigotry, and as we continue the work of tikkun olam. Finally, we are less than thirty days away from our October meeting in Las Vegas, Nevada. Last month we released our DNC Member Fall Action Plan: five concrete actions that members could take to help us win in November and beyond. As we gear up to meet in October, I want to touch base again on the progress of the plan with everyone next Friday, September 29th at 5pm ET.Please join me for the call. During the October meeting, we’ll be appointing our 75 at-large DNC members and reappointing our four DNC standing committees. Many of our members have already shared their recommendations, and I’m encouraging everyone to participate to make sure we choose the most diverse and representative group as possible. If you have not shared your at-large candidate recommendations already, please do so by completing this form no later than Friday, September 29th. Democrats are continuing to notch victories at the ballot box. This week, we flipped two seats in Oklahoma and New Hampshire – both in deep-red districts that Trump carried in November. These victories are just the latest example of how voters have lost faith in the Republican Party and are hungry for Democratic leadership. Our candidates have now flipped six state legislature seats since Trump took office, and as long as we continue organizing and mobilizing across the country we’ll be unstoppable. When Democrats lead with our values, we can win in any zip code from the school board to the Oval Office. As Democrats continue to pick up seats at the ballot box, DNC CEO Jess O’Connell has spent her first 100 days working hard to help us build a lasting party infrastructure. 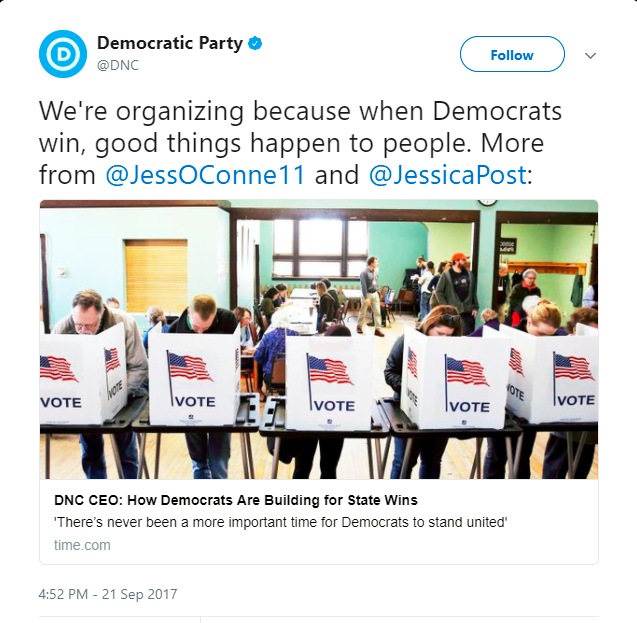 Check out her tweet thread this week explaining the exciting changes we’re undergoing at the New DNC. 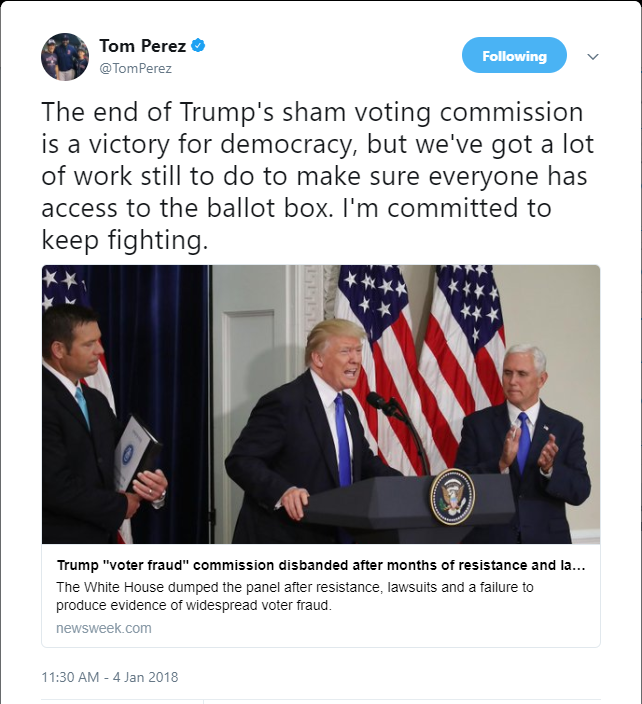 On Tuesday, as Kris Kobach convened Trump’s voter suppression commission in New Hampshire, the DNC’s Commission to Protect American Democracy held a press call about Trump and Republicans’ attempts to restrict voting rights and how Democrats are fighting back. Make no mistake: this isn’t a war on voter fraud, it’s a war on voters. As Democrats, our goal is to engage every eligible American voter as an active participant in our democracy. That’s why we’ve set up a DNC commission to combat Trump’s lies about voting and help expand access to the ballot. This week also marks the start of Hispanic Heritage Month, a time to celebrate the accomplishments and contributions the Hispanic community has made to this great nation. 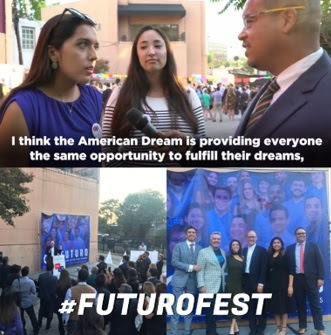 As the first Latino chair and the son of two immigrants, I was proud to join the Latino Victory Fund to kick off the celebration at the DNC’s FuturoFest. On Wednesday, Democrats Live was packed full of special guests. 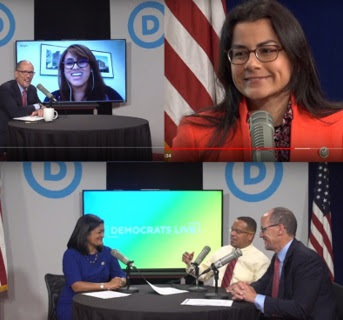 DNC Deputy Chair Keith Ellison and I hosted Rep. Nanette Barragán, Rep. Pramila Jayapal and Ellie Perez, a DACA recipient, who joined us via Skype. We discussed Trump’s heartless decision to end DACA, what next steps Congress must take to pass the DREAM Act, and how communities across the nation can organize to protect DREAMers. We’ve also spent this week pushing back against the latest effort by Republicans in Congress to take health care away from millions. Like each of their previous attempts, the Graham-Cassidy-Heller-Johnson bill would have devastating impacts on Americans across the country. Democrats believe health care is a right, not a privilege. 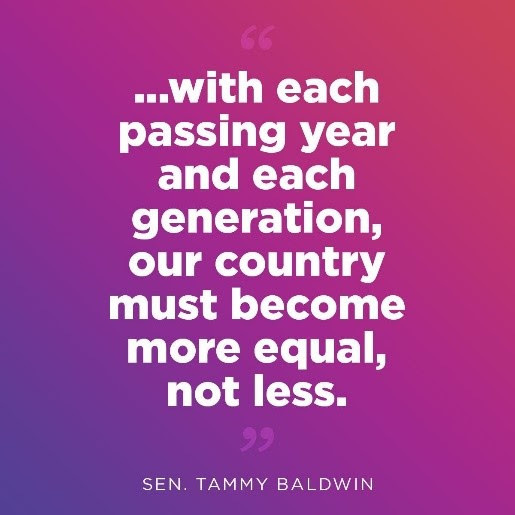 That’s why Senate and House Democrats are working together to expand coverage for all Americans. It’s time for Republicans to listen to the people they represent and join Democrats in our efforts to improve our health care system for the American people. Finally, I want to take a moment to remember a great civil rights hero we lost this week. 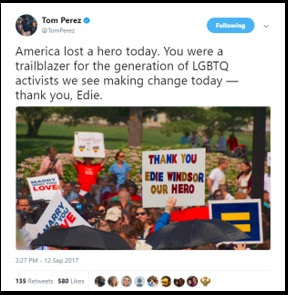 Edie Windsor was a fearless pioneer for progress. When our laws betrayed the promise of equality enshrined in our Constitution, she stood up. When our lawmakers were too slow to act, she spoke out. And when a generation of LGBTQ Americans hoped for a path forward, she took the fight for marriage equality to our highest court. Before the Supreme Court handed down its decision in Windsor v. United States, Edie said, ‘I think justice will prevail. Is that crazy?’ Because of her indomitable spirit, justice did prevail. Love is love. And America is better for it. It’s up to us to honor Edie’s legacy by picking up where she left off and continue fighting for the full equality LGBTQ Americans deserve.